Thiru Arimeya Vinnagaram is one of the 108 Divya Desams of Lord Vishnu located in Thirunangur, Nagapattinam District, Tamil Nadu. 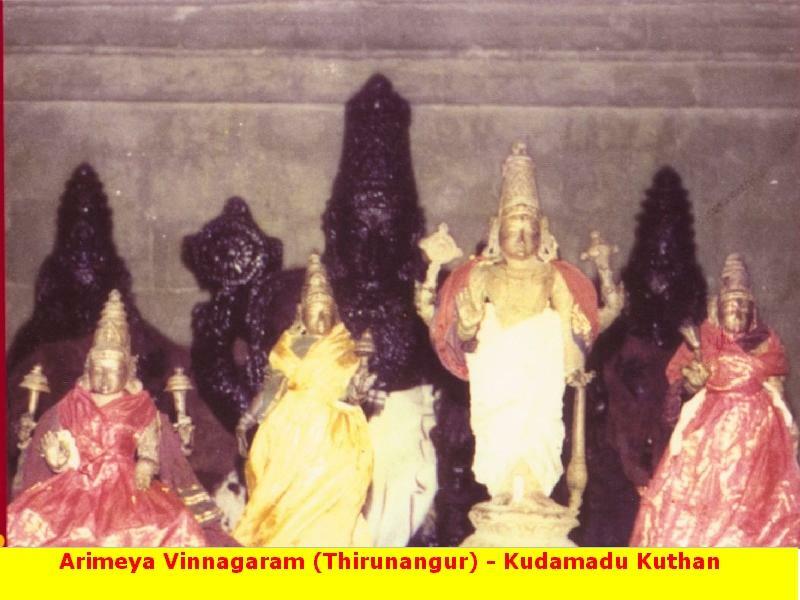 Thiru Arimeya Vinnagaram known as Kudamadum Kutthar temple is one of Thirunangoore Divya Desam and one of 108 Divya Desam temples. Devotees pray for prosperous life, for relief from enemies and debt burdens. Devotees perform Tahailakappu abishek to Lord. Lord appears in the sanctum sanctorum in a sitting form with one leg placed on a butter pot. This darshan, according to belief, brings all happiness to devotees. As Lord came to this place dancing with a pot-Kudam, He is praised as Kudam Aadu Koothan. The name also refers to the event of Lord holding the Govardhana hill as an umbrella to protect the people of Gokhulam when the place faced a heavy rainfall. Procession deity is Chaturbuja Gopalan. Tirumangai Azhwar in his Mangalasasanam hymn describes this place – Ariyameya Vinnagaram – as the abode of Lord who destroyed demons, extracted nectar from the milk ocean and guiding people on the righteous path. This is one of the 11 Divya Desams in Tirunangoor region. The Garuda Seva in April-May is a very famous festival. As Ari (Vishnu) resides (Meviya) here, the place is called Aria Meya Vinnagaram. There is no flag post in the temple. The peeta is too tall that the devotee has to use the steps, indicating that in the Bhakti (devotion) path one has to climb many steps to reach God. The legend has that Sage Uthanga/Vipra Rishi learned Vedas at early stages of his childhood from Sage Vaidhyar. Sage Uthanga wanted to offer something precious as Guru Dakshina after completing his learning process. Guru Patni expressed her desire to have the earrings of wife of the King who was ruled that city. Sage Uthanga approached the Queen with his request to have her earrings to offer Guru Dakshina. The Queen offered him the earrings without any hesitation; she was already heard about Sage Uthanga’s truthfulness. Uthanga happily returned to the hermitage of Guru, on his way back he was too tired of hunger and thirst, so he decided to rest for a while. Immediately there appeared an attractive cowherd with a mud pot on his head and a bamboo stick on his hand dancing with his own tunes surrounded by his cows. Uthanga solemnly requested cowherd to give him something to drink from his pot. The cowherd mischievously answered that the pot contains cow dung and its urine that was accepted by his guru Vaidhyar once. Uthanga without any further thought immediately put down his belongings and stanchly accepted the same. At this point of time, there appeared a guy from nowhere, he cleverly seized his belongings and ran off. Uthanga chased the fellow, but the guy whizzed into a manhole. Uthanga desperately requested cowherd to help him to get back his belongings. At once there arrived a man on his horse back, Cowherd suggested Uthanga to request him for more help and followed Uthanga. Uthanga anxiously approached the man on horseback and he explained the whole pathetic state of affairs. He was deeply moved at Uthanga and promised to help him to get back his belongings. He moved in front of the manhole and forced the horse to sneeze boisterously, as a result it spews out blazes from its nose. The guy who was in the manhole surged out with the unbearable heat. He returned the belongings of Uthanga and begged for forgiveness. Uthanga expressed his gratitude to Cowherd and the man on horseback, he happily returned to the hermitage of his Guru. Sage Uthanga explained everything happened to Sage Vaidhyar. After listening to Uthanga, Sage replied that the Cowherd was none other than Lord Vishnu, the horse was Lord Agni and the man on horseback was Lord Indra, in order to test Uthanga’s devotion towards his Guru. The cow dung and urine were the divine nectar helped Uthanga to remain safe and sound. Sage Uthanga’s yearning to envision Lord Vishnu in the form of cowherd grew more and more after listening to his Guru Sage Vaidhyar. The most compassionate Lord gave dharshan as Sri Kudamadukuthan to Sage Uthanga on this sacred land. Thus, this sacred land has got its name Arimeya Vinnagaram from ‘Hari Meviya Vinnagaram’. Another legend has that Dakshaprajapati conducted a Yagna without inviting his daughter Sati Devi and Lord Shiva. He invited all the sages and deities with due honor and respect. Dakshaprajapati disliked the presence of Lord Shiva and Sati in the Yagna Arena due to the severe animosity towards the Lord, he cleverly created a huge turmoil in the relationship between Sati Devi and Lord Shiva. Lord Shiva - Lord of Lords who was knower of all warns Sati Devi about the chaotic end of Yagna, discourages Sati from her visit to Yagna Arena. Finally, Sati left mount Kailash with Nandikeshwara after a sequence of heated arguments with Lord Shiva. She was humiliated in the Yagna arena and she had to give up her life in the sacrificial fire. Consequently, Lord Shiva in a mounted anger performed Rudra Tandavam, so aggressive was the cosmic dance that the hair fallen from Lord were turned out Rudras. Instantaneously 11 Rudras were furiously started to perform Rudra Tandavam. Sensing the possibility of destruction to the Universe, Lord Vishnu appeared before Lord Rudra. Lord Rudra was pleased at the presence of Lord Vishnu, prayed to remain in this sacred land in 11 forms. Therefore, Thirunangur turned out 11 Divya Desams of Lord Vishnu. The place is 8 km far from Sirkali. Buses are available only at specific hours. The visitor may reach Sirkali-Annankoil. The temple is 2 km from here.